When you are recovering from a recent illness or have become disabled, trying to take care of your home can become a heavy burden. Let Covenant’s home health aides take on the task of looking after your home, leaving you to focus on your health. 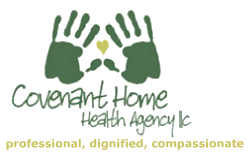 The home health aides of Covenant Home Health Agency LLC have gone through, thorough background screenings before being hired. To learn more about our hiring process we invite you to call us at 614-522-0521.